It was coming up to Halloween 2015 and we over at the gorgeous Isla Gladstone Conservatory in Liverpool for a bridal shoot with Fuller Figure Fuller Bust's Georgina. Georgina is a wonderful model to work with who's brilliantly laid back and lovely to work with. The shoot was imagined and co-ordinated by the amazing Becca at Edith Winston Bridalwear who had big plans for our shoot. Luckily we both completely 'get' one another when it comes to our vision for our bridal shoots. and so it makes the day effortless and a whole lot of fun! We'd be showcasing Edith & Winston's Callista and newly added Ronald Joyce Dresses which I really keen to shoot! We also had with us Flossy & Leigh Bridal Make Up and Hair! It was my first time on a shoot with F&L as make up artists and I was really looking forward to meeting them having been fully aware of their incredible make up talent on gorgeously made up brides in the wedding industry. The White Orchid kindly supplied us with some stunningly beautiful bouquets and Love Lights the Way completed the shoot team set-up with their light up LOVE letters and their brand new sparkling tree! Love Light's the Way's white clean lights looked perfectly at home at the Isla Gladstone Conservatory and made the perfect backdrop for our shoot. The Isla Gladstone Conservatory is a gorgeous open wedding venue located in Stanley Park between both Liverpool and Everton football clubs. The building itself is a traditional Victorian conservatory set in landscaped gardens within a Victorian park, surrounded by beautiful rose walks and stone pavilions. 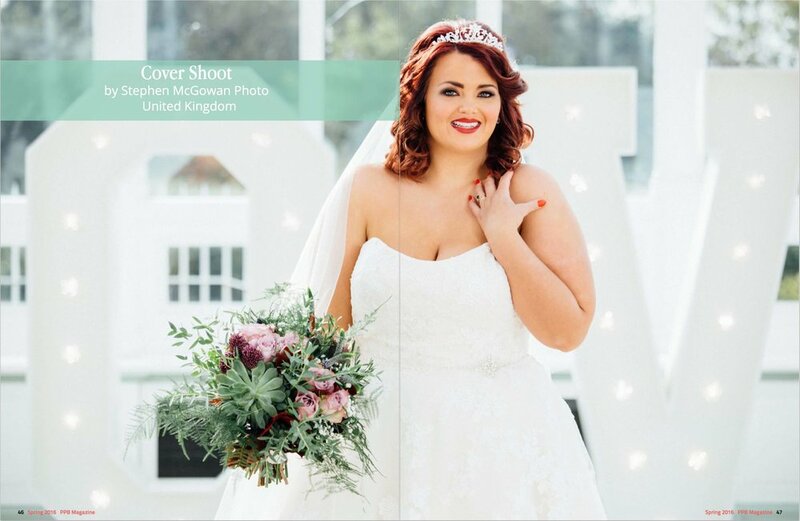 Pretty Pear Bride is a plus sized bridal magazine. Based in the US, the magazine gives inspiration to plus size brides around the world, an ethos which echoes Edith & Winston Bridalwear. So without further ado, here's Pretty Pear Bride's full front cover, along with our featured shoot at The Isla Gladstone Conservatory, Liverpool Wedding Venue.